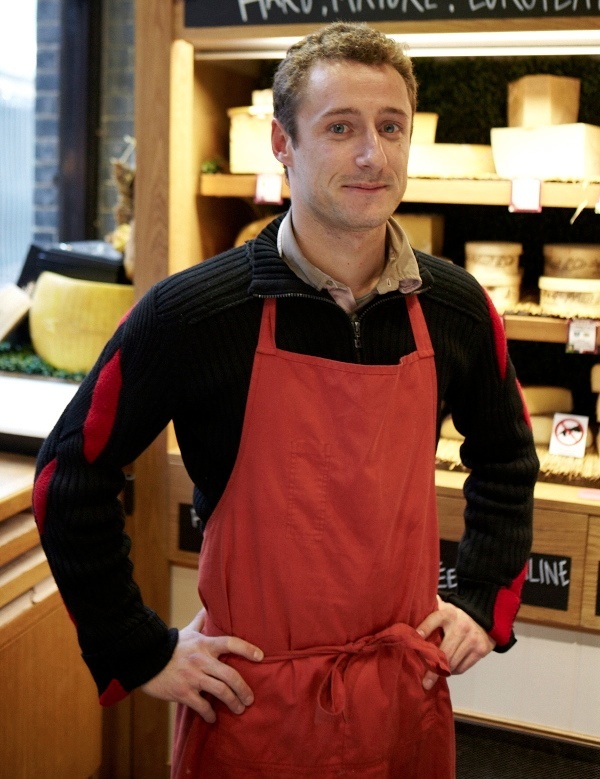 Alex Guarneri is the big cheese in Spitalfields. The man with the nose for fromage. And a very handsome Gallic proboscis it is, long and elegantly sculpted and extremely sensitive. Wisely, Alex has always followed his nose and it has led him in the direction of all things cheesy – with the result that today le fromage is his existence, his religion and his life. Both a connoisseur and an evangelist of cheese, Alex has lessons to impart. Alex loves to talk cheese. Alex wants to tell you that it is all about timing. Cheeses for all seasons. Alex ensures he gets the cheese direct from the maker when it is at its best and then he matures it in his cave until it is just right, not too ripe. Alex prefers you to be frugal. Be like the church mouse and buy a little piece of cheese. Alex does not want you to keep it until it goes stale. Alex wants you to eat it now. 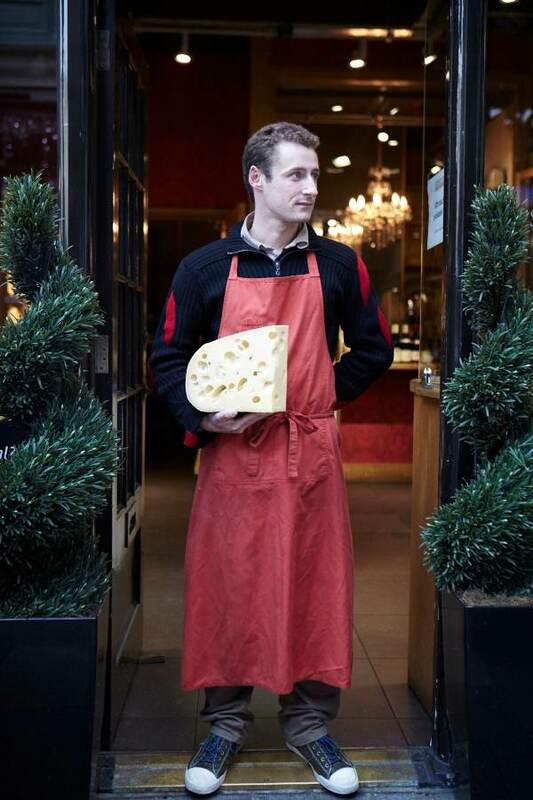 As a proud Frenchman, Alex sees cheese as an egalitarian birthright. He has no truck with the snobby British notion of posh cheeses as luxury food. In fact, Alex refuses the sell large pieces of cheese or to supply cheeses early for Christmas. Alex suggests you bring him whatever you might afford to spend on cheese at the supermarket – however modest – and he will find you something much better for your money. Demonstrating a nose for business as well as for cheese, Alex capitalised upon his privileged knowledge of both British and French cheeses, brokering a deal between Androuet and Paxton & Whitfield that gave him the franchise to open the first Androuet shop in London.“We created a partnership, supplying French cheeses to Paxton & Whitfield and they supply us with English cheeses that we export and sell in France.” he revealed proudly. 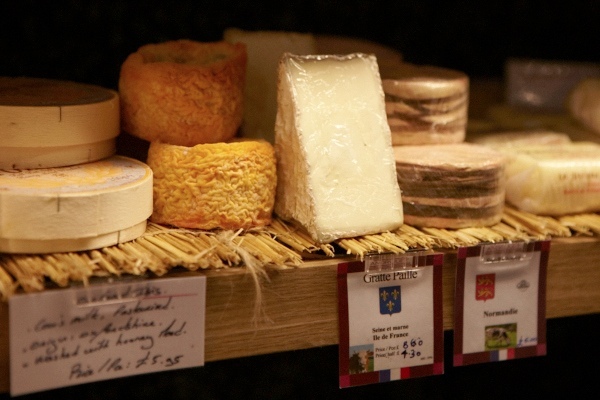 Starting from a single stall in 2009, Alex and his brother Leo have graduated to a cheese palace – their shop Androuet in the Spitalfields Market with an ever-changing stock of French and English cheese, and a small restaurant with a cheese-inflected menu created by chef Alessandro Granot. 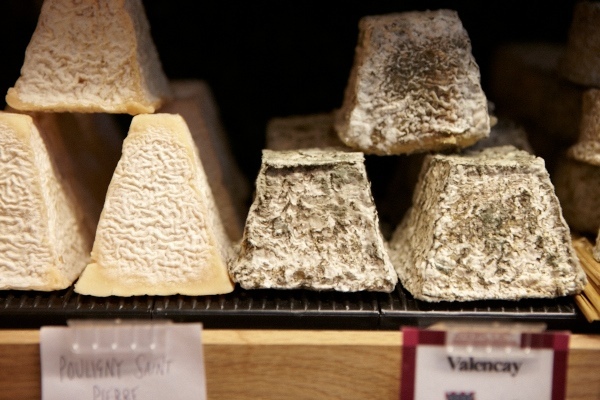 Indulging in a little spéléologie, we descended deep below the Spitalfields Market to Alex’s magic cave where his cheeses sat ripening, awaiting their destiny in the gloom – acquiring character and personality over time, just as we all do in life. Some were cheeky, others were reserved, yet Alex was encouraging them all towards perfection. Alex Guarneri is the cheesemonger of the moment. Alex Guarneri – the man with the nose for fromage. 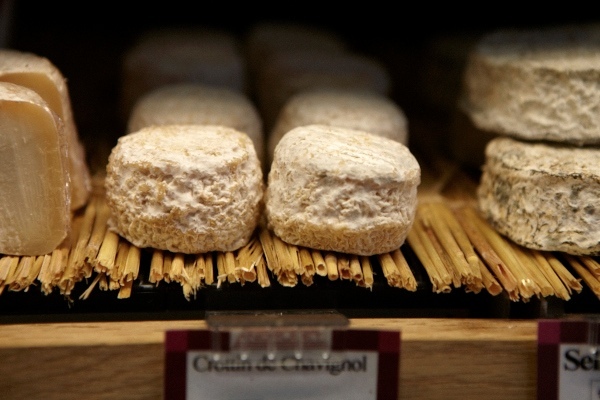 Amazing, I bought a Valencay today from my cheese guy at a farmer’s market in LA. Small world and all that. Get Alex to tell you the story behind the shape, it’s good. As is this blog, it’s a regular read for me. Wonderful to ‘meet’ a Frenchman who appreciates English as much as French cheeses. Here in our bit of France it’s pretty much impossible to buy anything allegedly English beyond a greasy shrink-wrapped cheddar. No wonder most French think we don’t ‘do’ cheese. Ah, cher Alex, il a du nez (literally and figuratively)! I feel I must commemorate his profile on one on my (faux) Delft tiles. Bravo monsieur. One of my ‘food heroes’ as they say. A fantastic shop, blessed are the cheese-makers. Just heading there right now…. Oh, to be a cheesemonger. To me, heaven is a bookstore that sells fabulous cheese. I am rather particular to the food. I am from Wisconsin, where cheese is one of our four food groups (the others consisting of beer, milk, and bratwurst). A lovely shop – they do a nice lunch to take away too! Even for a frenchman it’s a fantastic address! those two brothers are so pationnated that’s a real pleasure to eat at the restaurant and then buy cheese. My cousin bought a superb cheese wedding cake what an experience! Keep this high level of quality and service for ever! They do the best cheeses, have the best service AND one of the best cheeseburgers I’ve ever had in the adorable restaurant attached. 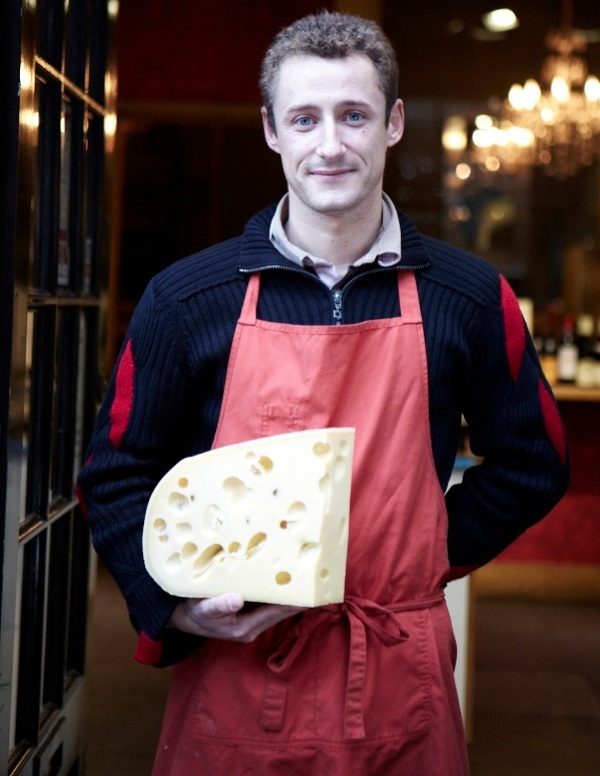 Alex has an unrivalled knowledge of cheese and an immense appreciation of good food that makes every visit a pleasure.